Discussion in 'Downhill & Freeride' started by Transcend, May 30, 2009. Finally have the sticker kits in for the Transcend Orange Team 224s. Nice and simple! They even look decent on the size gigantoid bike. Fancy! Looks like a top-notch job on the stickers. 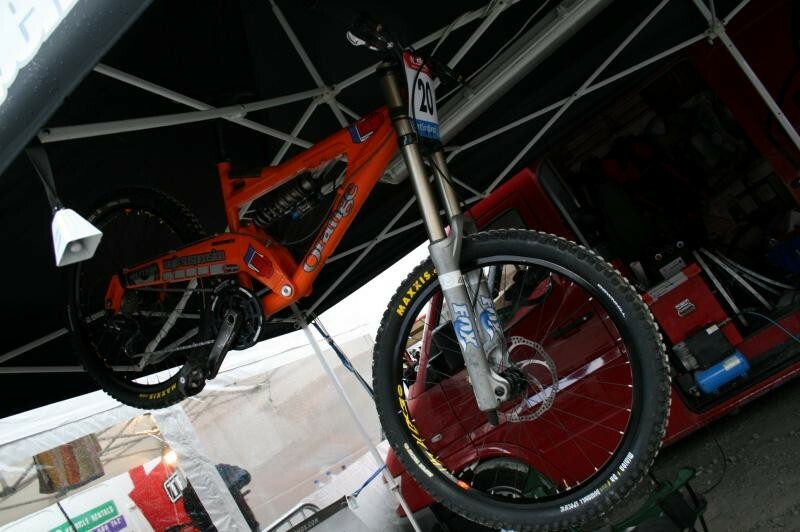 With a tubeless set-up those 224's must be ridiculously light weight. Perfect setup. Love the color too, the stickers look great with it. Very stylish. Looks strangely different than other 224s but in a good way. Oldschool colour and stickers. The 15", with fairly normal parts, tubeless, and some ti hardware and spring they are high 36s. The 17" in the picture sits about high 37 if I remember right. There's another potential 22X bike joining the party next Wednesday. Photos to follow. That big 'ol swingarm sure makes a perfect billboard. those rims still holding up good? think i am going to get a set soon. I'm glad I bought yours!!! Transcend, are You still happy with ZTR Flow rims? I've got Mavics XM321... would you trade them for ZTR Flow? I'm quite happy with the ZTR flows as race rims or rims for a lighter rider. If you are a big guy, or freehucking to flat and rocks, I wouldn't recommend them. As a race rim though, they are fantastic. Of 4 riders, only one so far has managed to hurt a rim, and he is 200+ pounds and 6'+. He is also reknowned for destroying things. They lasted the US Open under him with no problem. Pls remind be, what hubs and spokes did you use? Have those frames changed that much in the last 10 years. Do they need to??? When it comes down to it, how much can you change something so simple??? For records sake though, there's been small updates just about every year an the only parts from my recollection that haven't changed since the original 222 are the top tube an the seat tube. Same could be said for your new Karp, how different is that to the old ones??? Sry but I had to. As for orange they put much more pressure on the geo and overall frame feel instead of gimmicky susp so on the outside changes are small as they seem mostly to tweak the geo (and the breaking cs some time ago in 222-223). It's that numbers people love them for. Almost went for one myself. For records sake though, the only parts from my recollection that haven't changed sine the original 224 are the top tube an the seat tube. While there are some aesthetic similarities to the older Karpiels, it's a completely different bike. That design has been around for years, long before Transition used it. Yep, actually it works pretty well though. nice looking bike, I like the color too. This is one of those things that I forecasted years ago. Cannondale, Morewood, Orange, others. They all slowly moved to linkage-actuated SP designs. There are just too many advantage to never upgrade. 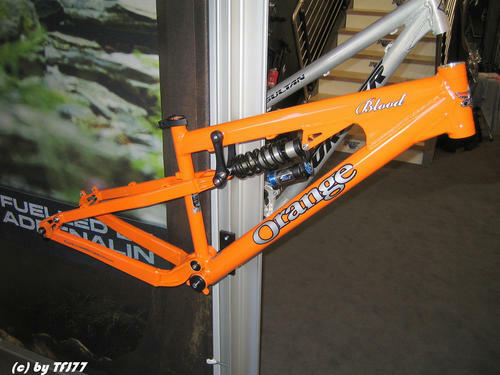 Sure, Orange dialed the geometry, refined, blah blah blah, but in the end they can have an even better perfoming bike if they do all the blah blah blah with a decent linkage controlled SP design. It is funny to seem the "eat their own words" so to speak, but that's probably better in the long run than subbornly claiming that their non-linkage bike somehow can compete with the others. The lateral rigidity and shock-rate-control of a linkage design can not be matched. Told you they would look sick Fraser! I'm glad we went with white, can't wait to see the pics from ft bill. How do the names look? The pic on the iPhone is too small. was it you Fraser today at the yellow tent next to the lift line with the baby blue 224? what kind of rear shock was that? x-fusion? Tell us, what else have you forecasted???? that new linkage Orange is substantially less ugly and primitive looking than the old one. Well, when you're that far ahead, it takes a lot of time for others to catch up, hence Push using the avy internals now (not to mention that Avy came out with their high/low compresion adjuster circut, so they didn't exactly just stagnate, and they brought their technology to many different shock configurations). 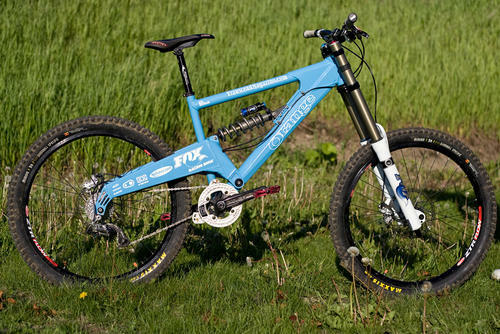 Otherwise, you may be a fan of SPs, but I'd be willing to bet that every company that makes their front-line DH bike as a SP with no linkages will eventually move to linkages or die. Biluk? he's a bit of a dumptruck. Dumptruck is the nice way of putting it, ya. As for the protos, stay tuned for this week. They officially go into strange status this week under a few riders. What about your wheelset, Transcend? Stans ZTR Flow rims, DT Alpine spokes, Hope Pro 2 hubs. I've got Mavics EN321, DT Competition 2.0-1.8 and Hope Pro 2 hubs, as well. Do you use them as tubeless? No problems with inflating? Is floor pump enough to do that? Are the riders using UST tyres or standard dual ply? Fraser is actually travelling on his way to Europe so let me answer that question. Actually we were using both, but mostly UST tyres. - No burbing yet on UST tires even at very low pressures 22 psi etc. - the low height of the rim's side walls reduce the chance of pinching and cutting the tires around the bead, something we saw often on a Mavic 823. - Very easy to install tires on rim "by hand "
- Rims hold air really well even when sidewalls are dented. - Easily inflated with a standard floor pump. I've ridden a lot of bikes. The Orange 223 I had a few years back still stands out as a favourite. It may be nostalgia, it may be that I pulled better results on it than on any other bike since, but I still think that design is one of the best out there.